It's an interesting theory, Richard, but it's pretty thin on evidence and thick on speculation. Erdogan's perfidy is well established but it's more than a reach to conclude that Clinton and Obama backed ISIS. "Emails on HRC's private server confirm these tragic events, and Obama & HRC thought they could pardon each other after the election. Little did Obama/HRC realize that an auto-sync feature between Huma & Weiner inadvertently saved the deleted emails on Weiner's machine." Tell me, how many of those emails have you read? Some? Any? Obama and HRC thought they could pardon each other after the election? Really? That's Sean Hannity stuff. Please, direct me to the emails you contend support this bizarre theory. Tell me what they say. I've been following, and documenting this theory for years. I have no doubt the emails exist. I could go on and on. I've known this was going on the whole time so have I read the emails? No. I believe Hector, a form USAF officer knows what he is talking about for the most part. The story is nothing new to me, the U.S. created ISIS. The CFR knows it, Putin knows it, the whole world knows it. And its finally coming out in a multitude of areas. Did you believe all those former US Navy veterans who Swiftboated John Kerry? A lot of Americans were convinced. Tell me, in a country that can't keep anything secret, how did the US manage to keep the lid on the ISIS story? Where are the dozens of whistleblowers, people genuinely on the inside, that would have spawned? And, as for RT, Russia Times, as a primary source, that's kind of dodgy. "Tell me, in a country that can't keep anything secret, how did the US manage to keep the lid on the ISIS story?" "Russia Times, as a primary source, that's kind of dodgy"
The video of Biden is widely circulated, RT didnt create it, they simply post it. I expect better of you Mound, of all people you should know to evaluate information based on the info itself. Further, as Wikileaks has shown incredibly well, the entire western press is a propaganda machine. You can't say "RT is kinda dodgey" while sucking up everything you see on western media about wars that clearly benefit us, that we are illegally in. U.S. support of ISIS is widely known, don't tell me you've been sucked into the McCarthyism propaganda going on? You should know better. As for your question RE whistleblowers.. have you not read the Podesta emails? Its now very well documented how the U.S. funneled weapons to ISIS. Right here in this post, I link to a Turkish police chief (Turkey is a NATO ally, and a major part of the pipeline) confessing to supporting ISIS. Heres the question I have for you? How many whistleblowers would it take for someone to actually listen? Also one more thing, a former state department official has literally taken credit for leaking the documents to Wikileaks: https://www.youtube.com/watch?v=ov5kvWSz5LM -- Yet no where in the news is this found. Funny eh? It's all "Russia's fault". It's all one big lie after another. Here is an interview Assad just gave, read the full text: http://sana.sy/en/?p=92287 Notice how it fits the facts? Why is it the Russian/Syrian story has remained the same for years while the U.S. has repeatedly changed theirs? The truth doesn't change. One more thing, I and many others have been talking about this ISIS thing for a long time. The simple fact is, they _didn't_ keep the lid on it. It's just that every time it comes up people seem more interested in asking questions like "well gee how did they ever keep it secret?". If the amount of material provided here doesn't show you that they haven't kept it secret, and that it has leaked out numerous times, then I seriously don't know what will. Perhaps the reason why it hasn't yet breached the mainstream is that no one else is willing to talk about it, and are too busy asking how the gov't keeps its secrets, rather than asking the govt about those secrets themselves. The creation of ISIS came straight out of Iraq, immediately preceding the 2003 US intervention. It is a British/US/Israeli creation. You may or may not recall that Turkey was opposed to the US intervention of Iraq in 03 and disallowed the use of Incirlik at that time..
"President Assad: Part of it is related to what happened in Iraq after the invasion in 2003, where the American army or the Americans in general control everything in Iraq, including the prisons, and the leader of ISIS and most of his entourage were in the same prison. So, ISIS was created in Iraq under the American supervision"
President Assad: Of course. In 2006, of course, before the withdrawal of the Americans. That’s why they played either direct role or indirect role in creating ISIS. 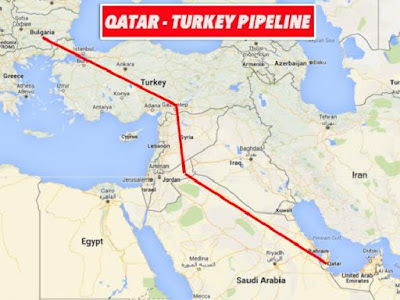 ISIS did not come to Syria from Turkey either? It came to Syria via Iraq. The final capture of the airport in August immediately boosted the prestige of its unruly mastermind Tarkhan Batirashvili, according to analysts—an ethnic Chechen whose warring skills, learned in the U.S.-funded Georgian army, are now being put to use by a group deeply at odds with more mainstream Western-backed rebels. - The roots of ISIS go back to Oct. 15, 2006, when what is known as the Islamic State of Iraq (ISI) was established. ISIS was formed in Iraq- Emerging from the ashes of the US led invasion? Nice language. Romantic, evocative language. But, what does it really mean? This tells me the US invaders birthed ISIS. President Assad: Let’s say, the endorsement, the greenlight, first. Second, the American coalition, which is called “international coalition,” which is an American. 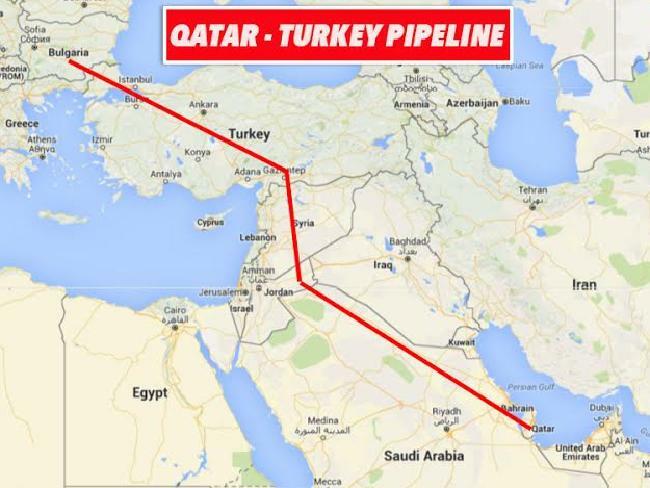 They could see ISIS using our oil fields and carrying the oil through the barrel trucks to Turkey under their drones. Think about the numbers of NATO bases in Turkey- Turkey like Canada is NATO occupied territory.. Sorry Penny I have been away. Yes, you are correct they were a NATO conduit. I've also written about the shipments thru there. As I recall Nafeez doesn't say they were created in Turkey, indeed he himself has written numerous times about their creation in Iraq by the U.S./Israeli/British. But the geopolitical tables, they are a changing. Sorry I can not write more about this at the moment as I must author a new post.